If you're desperate for unlimited soup, salad and breadsticks but your babysitter just bailed, good news! 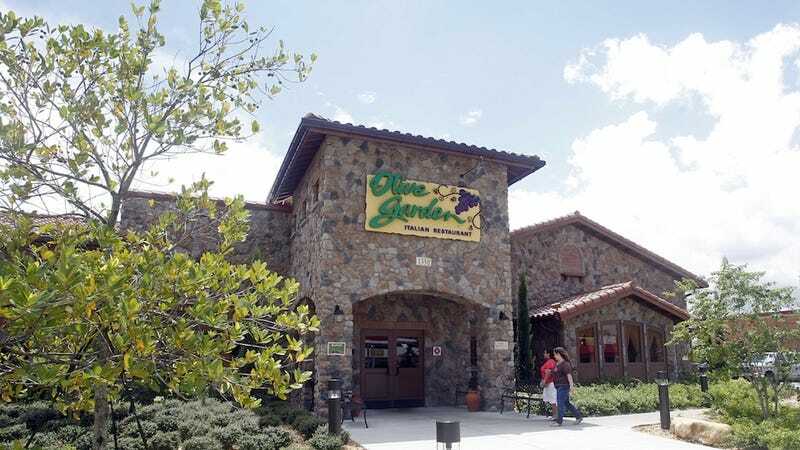 Olive Garden is running a "Parents Night Out" promotion, where they will supply diners with a babysitter. Unfortunately, the offer is for February 7 only, and they are not offering to slip Susie from next door a twenty. Instead, AdWeek reports, Olive Garden will be partnering with MyGym, a chain of children's fitness centers, for free babysitting. (It's like a Discovery Zone crossed with a New York Sports Club, as far as I can tell.) There's been a bit of griping about promo's limitations on the company's Facebook page, which just goes to show how many parents would like to enjoy a couple hours of carbo-loading in peace. Beats letting them run laps around the Cracker Barrel store until you're done with dessert!